An accelerator takes precedence over normal processing and can be a convenient way to program some event handling. For example, you can use an accelerator table to enable a dialog with a multi-line text control to accept CTRL-Enter as meaning `OK’ (but not in GTK+ at present). did not sound good. I want this to work in Linux too. Therefore I added it as a proper menu item with an accelerator and everything but somehow the TAB combo would simply not work anymore, possibly because of some kind of conflict with Scintilla, what do I know. Another key than TAB for this is unacceptable, hence the workaround. Here is actually another small workaround evident, for some reason evt.get_key didn’t work with Ubuntu Feisty I’m working on – in the form of a VM – at home, chr = @sci.get_char_at(@sci.get_current_pos – 1) works just fine though. Unfortunately we can’t do anything actively when onModified is fired, only record state, therefore we set some variables instead. When TAB is pressed while having selected an s-expression all lines will per default be indented with a predefined number of spaces, in my case 4 I think, after that the cursor will end up at the first position on the first row of the expression. We check for this position, a selection and a space in the current position, if all these conditions are met it can only mean one thing, we have a multi line indent command which instead of indenting everything should “clean up” the whole s-expression a la Cusp. Therefore we set the @back_tab flag to true, and the start + end line we are going to work with. As it happens onUpdateUI will fire immediately after onModified, the user will never notice our ugly after-the-fact hack. We start with getting rid of any possible selection to prevent any unforeseen effects associated with such a state, it might very well be that this line is unnecessary. The main thing is that we will loop through the affected lines and indent them one by one. During every iteration we jump to the first position on every line. pos_func  = direction == "right" ? "position_after" : "position_before"
This is the “engine” of this whole thing if you will. We will first check if we are on the first line in the editor or if the above line simply is a bunch of white spaces, if that is the case we simply ident with 0 spaces. If not we will use findParPos (which has been remade since the prior tutorial I might add) to get the position of the parens that completes the pairing. In this case we will walk to the left, or upwards if you will. Note the use of position_after etc, using these functions instead of simply iterating should ensure that we handle strange character encodings properly. Character 34 is “, we don’t count parentheses inside strings. When the modulus returns non zero we know we are inside one. Note the check for par_count bigger than zero and the following condition and action, this section is for checking if we are working with a quoted list, if that is the case then the indentation logic needs to account for it. This behavior hasn’t been tested thoroughly yet, it works with simpler snippets though. @keywords = "apply pass maps map mapc maplist..."
6 => [200, 150, 0], #strings "hello"
Finally I can say I have the basic editing power of Cusp, at least the parts I’m using at the moment, there might be more cool stuff there that I haven’t discovered yet. 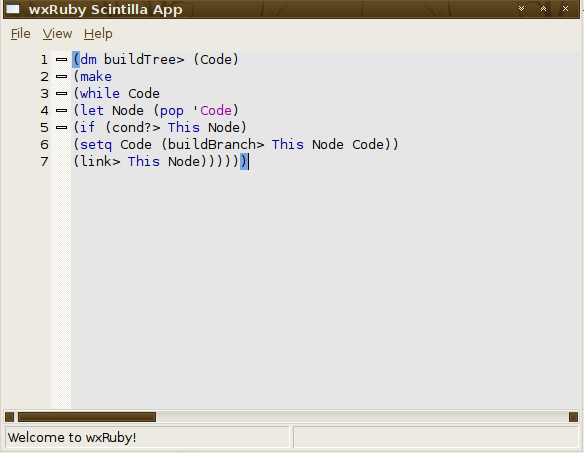 However the above makes for a satisfying Lisp editor as far as I’m concerned. At last we can start looking at stuff like auto completion and a project browser. And hitting Tab, lovely result! 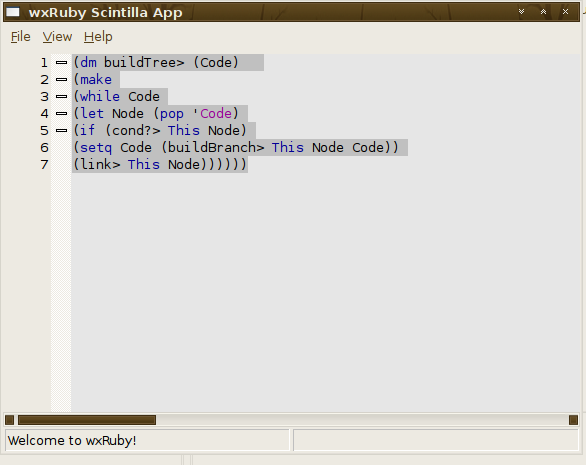 This entry was posted	on Wednesday, May 7th, 2008 at 1:12 pm	and is filed under Ruby, WxRuby. Comments are currently closed.